Hello friends....are you enjoying the great blog hop with Operation Write Home? I am so thrilled to be involved today to honor the brave people who have volunteered past and present to keep our country safe. From Sea to Shining Sea, thanks to those who keep us FREE. A big THANK YOU to the men and women of the United States military. Using Sketch 168 at OWH as inspiration. This card will make a wonderful Any Hero card. Just click the logo above to take you back to the beginning of the hop. Get involved. Make a card for a Hero. Now go...go create something wonderful for our service people to send home. This card is so different and attractive. I love the camouflage type font on the sentiment. and that curvy bottom to your panels makes for a very interesting look. Nice Job. Enjoy your weekend. Very awesome card, I like the camouflage on it. What a wonder, unique card. Love the shape of the papers and the borders, not to mention the colors. Love the way it looks like towels flying in the wind. Lovely card! This is so beautiful! I love the wavy edges and the faux stitching! Great job, Penny! Wonderful card. I especially like the way you have distressed the edges and the fold of the corners and the curve of the panels, which give the card a vintage look. The whole card says "Old Glory". Wonderful card. I love all the colorful papers you used. Very different and lovely card. I love the way you used the paper...especially the scored blue at the top: Such a beautiful card! Love the banner effect of the layers. Looks like they are waving in the wind. Great card. Wow you put a lot of time and detail into this card. I looked the aged look it has. Just beautiful. I love the antique look of this card. This card is gorgeous! Wow - this is fabulous! Love the muted colors and the distressed edges. God Bless our heroes and their families today and every day. Nice ideas here to borrow for my next project...going to mail my first box to OWH on Monday, can't wait. Great card Penny! I love the curved edge of your papers...replicates the wave of the flag perfectly! Thanks for joining in the hop today. Penny-this card is amazing once you realize how it's made--you really should give directions. I had to take several close looks and finally figured it out--wow girl I like your creative thinking!!! Penny this is gorgeous! I love the banners you made and the RW&B Love it! I like the papers and texture of your card. Any Hero would love to get it! Love it. The border, the distressing, the everything! love these large banner-style papers, what a beautiful patrotic card! Great texture on this cute card. I love the stitching!! WOW. Your distressing is fantastic. I know this is just paper but your distressing makes it look like old fabric. Great job! Love the layers - this card looks like it has alot of heft. Gorgeous--- absolutely love the thank you stamp set that you used-- so pretty!!! Fantastic card! I love the blue banner and the trim and edging on it especially. Very artistic . I like your interpretation of the sketch. This is so cool! I love all the different layers. This is so different from anything I would make, but I love it! Those papers are beautiful the way you used them. All of the little details really pull it together. The movement the card portrays is awesome! You did a fabulous job and I really like all the little details. Really great card. I especilaay like the texture you managed. The curves really make this card stand out! Great job. 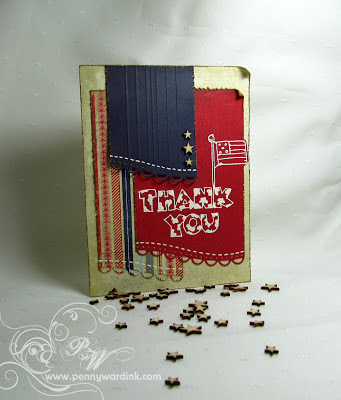 very patriotic..Thanks for a great card share, any Hero would love to receive this card. Beautiful card. Love that Authentique paper collection you used, I've made many projects using that paper. Love the embossed lines you included on the blue section. Wow! Awesome design. Love what looks like the bottom of the sleeve. Beautifully done. I love the die cut bottoms of your banners. This is such a good layout for a patriotic card. Great job! the papers look like flags waving in the wind. love it! The distressed look is interesting...I like how the folded upper rt corner is repeated in the design.......lots to look at!!! What a lovely and fantastic card! I love all the texture you added to it. Great design. Your card is so great. Oh my WOW. Your card is amazing. So very creative and terrific details. Really stunning for sure. I'm amazed by all the talent on this hop! Your card is beautiful and the stars are too cute! I really enjoyed looking at your card. The little stars are awesome detail. I love that Military Thank You stamp!! I've never seen one before. Hmmm...might have to track that one down! Thanks for your participation in the OWH Blog Hop! I love how you added interest by curving the bottom of the two panels and making them look like banners. Really like your card. Very appropriate for memorial day. Wow! Those curved edges on your paper pieces are so neat. Love it! I love the way you used the colors on your card with the touch of curves to make it pop ! Love the red/white & blue combo and the wavy borders on the bottom of the panels. A great card for a hero. What a unique and eye catching design on the card. Great use of materials. Nice going. What a wonderful card! I love the white embossing. Have a great weekend! And thanks for supporting OWL. I love that your card has so many textures. It make it very interesting. Great job! Beautiful card, Penny, it has so much lovely detail, but I love the embossing the best! TFS and have a blessed weekend. Love it! So creative. I like the curved lace edge with the faux stitching. Love the texture in your card. Just beautiful. Love how this card looks antique! Beautiful! Love the wave look and border punch of the three banners' edges. Really wonderful card! Thanks for sharing! Enjoy the layering and stitching technique. Love the tattered edges of this card. Beautiful paper choices. Great patriotic card! I especially love how each layer has a wave. Lovely! This looks like a group of hanging flags and banners....beautiful waving in the wind! Beautiful card...I NEED those wood veneer stars now after seeing this. Thanks so much for sharing your creation! WOW!! I can not pin down what it is about this card,but it just made me stop and look for a long time. Just LOVE it! Beautiful card - love the curved and punched bottoms on the layers! Very unique card! Love the way the blue panel seems to be billowing! TFS! I like the curvy edges and stitching! TFS beautiful card!! Great vintage looking card! I love the distressing! What an awesome creation! Thanks for sharing! I love how unique -in a great way- your card is and how you pulled off distressed so well. Mine always look dirty to me when I try! TFS and supporting OWH!! I'm wondering how you did the scalloped edge on the uneven edges. Hmm. I love the way this is layered! I'm wondering the same...about the curved scalloped punched edges. Very unique. What a cool looking card. The curves at the bottoms of the different elements is a great look! What an awesome card, I love the vintage look of it. Love the stitching and the sentiment. I like how you layered the pieces also. Nicely done! Thank you for sharing! WOW, what an amazing creation! They look like beautiful drapes hanging over the edge of your card! NJ! This is wonderful! I love the curved borders on the banners, and the little stars are terrific too! Wow, this is one fabulous card! Love your layout! Gorgeous and patriotic. This has such a wonderful, vintage feel to it and your distressing is excellent Penny! So many nice details.. great job. Thanks for joining in the hop and supporting Operation Write Home. Your card is fantastic! Love the layers and details. A really beautiful patriotic card with a unique look! What an awesome card...love the idea of a "sleeve." Love this card. It has a beautiful antique look. Beautiful job! Love the colors. Gorgeous patriotic card Penny! What a fantastic design and I love the tiny stars! What a great design...love the different panels with the border. Thanks to our troops! Your card definitely says patriotic! Love the choice of papers. Very patriotic and in some way a restful design. I see an old quilt over a clothesline in a backyard on a summer day. NIce job. I like the vintage look, you obviously spent some time planning this card.Thank you for sharing. Beautiful rustic style card. Love all those details! Such a beautiful card it reminds me of real cloth the way the blue lays on the card. Thank you for sharing an being a part of the OWH. I love that stamp and your card turned out great. Your card has a great vintage feel. Love those little stitch lines and the gold stars. Thanks for sharing! This is the coolest patriotic card yet, love everything about it. Great Card! Love the border you chose for each of the panels. Nice Job! Love how you used cloth for part of your card and the stripes underneath. Awesome job! I really like this card. I like the sentiment and the stamp. It looks so good in white. TFS and supporting OWH. Nice patriotic card. I really like this card!! It's so different but really awesome. Gorgeous card! Love how you used the sketch, the R/W/B looks awesome with the flag, stars, stitching! Awesome job! TFS! Stunning card Penny! Love your style. Thanks for your support of OWH. love how you edged those strips!! and the pen stitching is way cute! I'd have to run my fingers across the card to feel the sleeves! So cool! AND, I will be singing your little lead in all day! "From sea to shining sea...thanks to those who keep us FREE". Makes me smile! TFS! Cute card. Love the layers and curves. Thanks for sharing. What a beautiful card. It is clean and meaningful. Thanks for sharing and inspiring. Fantastic card, lots of little details so expertly put together. I especially like that border ! Thanks for the inspiration and making cards for our heroes ! Great papers and card design. Cute card! Love the patriotic theme! Very neat card. Love the look of the white sentiment on the red paper. Great card...the edges are so unusual...love the white sentiment..lots of visual pop! Such an awesome card. I love the edges which add so much. Makes it look old. I love it!! Cute! I love the banners and all the wonderful texture! Thanks so much for sharing and for supporting OWH! I just love the layout of your card! Beautiful patterned paper! Thanks so much for sharing your talent for this GREAT cause!! I love the unusual shape of the banners you used and the great color choice. 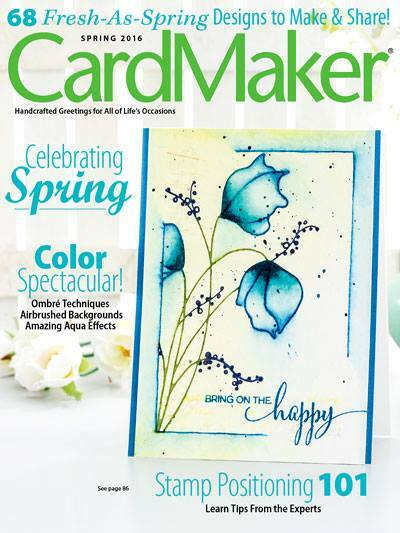 very nice card--thanks for encouraging others to make cards for OWH. Happy Memorial Day Weekend! Your card is stunning!!! I aboloustely love it. What a unique design and great way to interpret the sketch!!! Stunning card! Thanks for supporting OWH. Like your use of the spellbinders and stitching, unusual but brilliant design. OOh! Really like the "retro" feel of this card. The design and washed out fade of the papers, yet still colorful and sentimental. Love it! I agree I love the "retro" look of the card. I love it. Great card! Love those tiny little veneer stars! Gorgeous card! Really love the border punch on the banners! I missed this blog hop. Good thing I'm loitering on your blog. Looks like I'll have to follow your blog, your cards and projects are too great to miss!